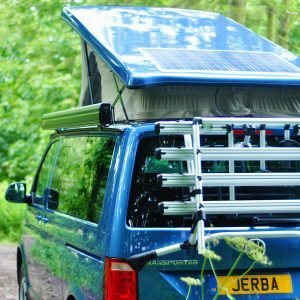 A solar panel on the roof of your campervan can dramatically increase your independence. In the summer months, the right size and quality of panel will produce sufficient amps to run your fridge, lights and water pump without the need to plug into 230v mains power or to have to drive the vehicle in order to recharge the leisure battery. To maximise the return we now always fit a 100 watt solar panel. The panel can be mounted on the roof of all our T6 conversion layouts, either elevating roof or fixed high top. The panel is a robust and very low profile design that is only 3mm thick – the cabling from the panel is connected from the underside so there is no need for a connector box on the panel’s topside. The panel is also covered by both a 5 year warranty for the product as whole, aswell as a 20 year cell performance warranty which states that at 20 years the cell output will be no less than 80% of the new performance value. On the best sunny days this 100 watt panel can produce up to 5 amps of charge per hour, so on an average summer’s day you can expect around 25 to 30 amp hours of charge – which is more than your fridge will draw. 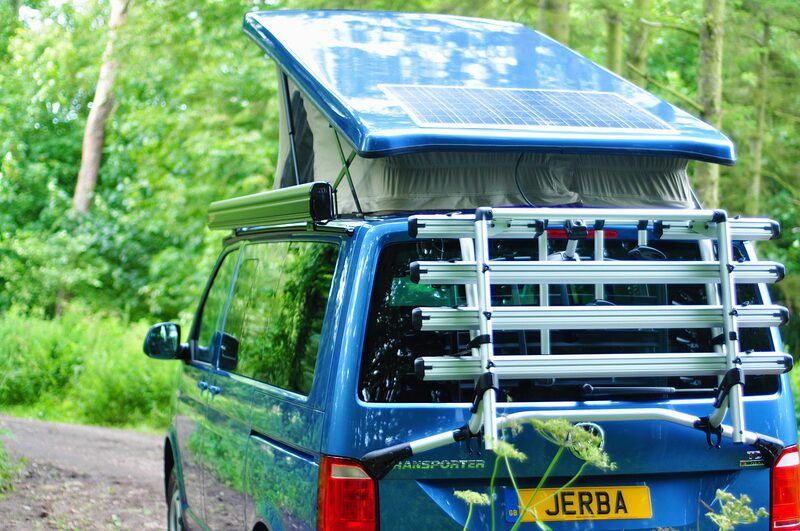 Connected directly through our Sargent electrical system the amps produced by the solar panel are split between the leisure and vehicle battery, meaning that if you leave your vehicle parked up and not used for a period then both batteries are constantly being topped up. Please note that the panel will never produce enough amps to run a diesel heater on UK winter days – the days just aren’t long and sunny enough, the angle of the sun is too low and the heater will draw too many amps.